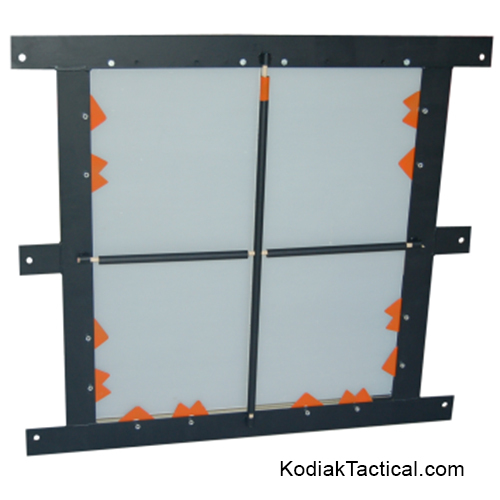 Kodiaks Breaching Window allows you to train without the hazards of broken glass and the down-time associated with clean up and replacing actual glass. Solid polycarbonate glass is nearly indestructible and can take a pounding! Simply slide the glass panels onto mounting pins and you are ready to go. Shards are constructed of steel for years of use and pivot out of the opening which requires the operator correctly clear them out of the frame before entry. Mount the window frame in an existing structure OR fasten to the optional frame (not shown). Optional set-up is shown giving the operator the added task of not only clearing the shards but having to clear the mullions too. Set up is quick and easy and uses wood dowels purchased at your local home center. Increase your training requirements by adding the optional “curtain” to the rear of the window, so not only does the operator have to clear the glass, shards and mullions, but must also pull down on the curtain rod to clear the heavy duty curtain assembly. Order any size, color or option. Multiple glass panels are available too. LOOK IN THE PHOTO SECTION OF OUR WEBSITE TO SEE A CUSTOM DESIGNED WINDOW BREACHING PLATFORM DEVELOPED FOR US NAVAL SPECIAL WARFARE.